Where were Finn and I, Cup Final day 2018? Great Western Coffee Shop > Sideshoots - associated subjects > The Lighter Side > Where were Finn and I, Cup Final day 2018? Really just logging the station visits. These two are easy peasy. Re: Where were Finn and I, Cup Final day 2018? Now, weren't you with me today? And a good afternoon it was. Slightly concerned that the first photo appears to show you attach Finn's lead through a ring in his nose. Correct! That's the second one. Chippenham was where Finn met Paddington Bear. 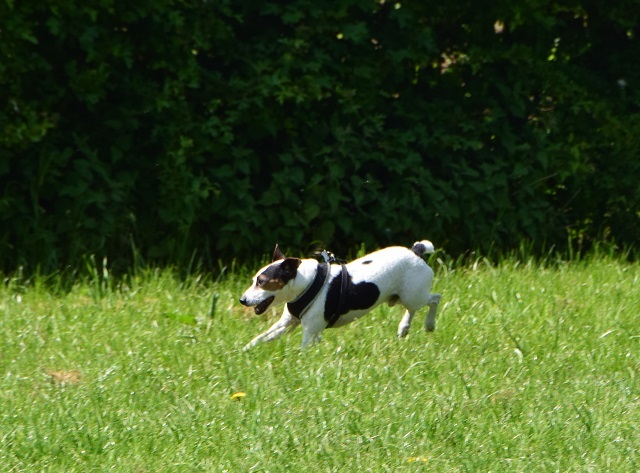 Now where else in Wiltshire would one take a novice doggie trainspotter? 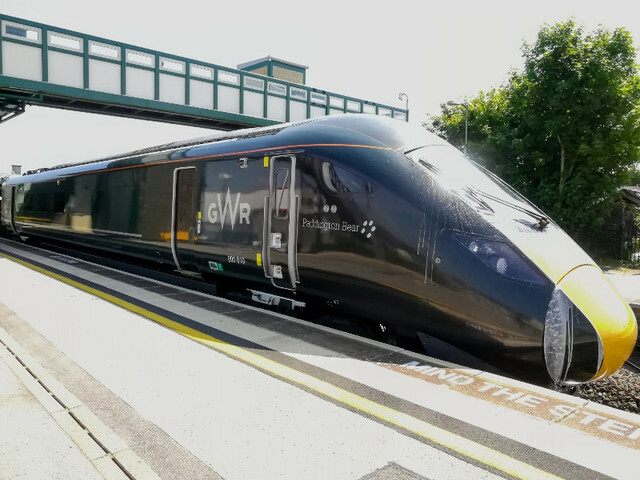 Personally I would take a novice train spotting dog to Westbury, as it's the crossroads / hub of rail networks in Wiltshire and there are lots of trains to see and lots of changing passengers to make friends with. There's also (at least at the moment) some patches of grass near the ungated station entrance to do drain-a-dog. 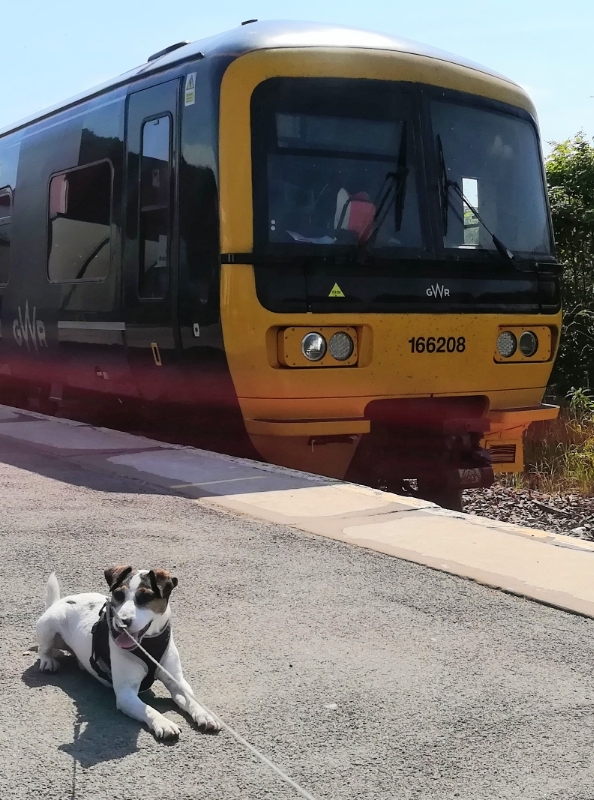 As an aside Teignmouth station is quite often used as a training ground for assistance dogs. 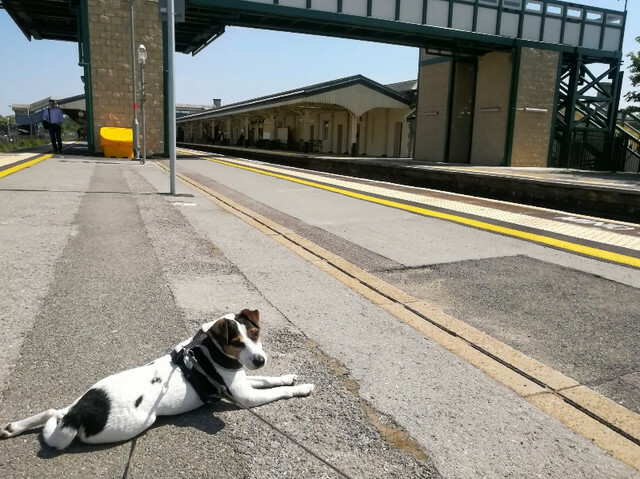 Apparently it has the right mix of stopping trains and non-stop expresses to get the dogs acclimatised to the railway environment. That is, of course, correct! Where Finn saw off bobm and met grahame. Makes it sound like he chased me into a field! Well, Finn wouldn't have had to run very fast. William Huskisson MP was the first person to be killed by a train while crossing the tracks, in 1830. Many more have died in the same way since then. Don't take a chance: stop, look, listen. "Level crossings are safe, unless they are used in an unsafe manner." Discuss.